Sacha Baron Cohen, the star of ‘Borat and ‘Bruno’ known for his spontaneous and humorous manor flips the script in The Dictator. He actually conforms to acting out a script rather than just simply disturbing peace. He did a great job in my opinion! (Although many seem to think otherwise). He acted a humorous character role and he made the crowd laugh. Without spoiling the film too much for those who have not seen it, The Dictator is about a Dictator named Admiral General Aladeen. He is a wild, prestigious leader of a made up country in N.Africa named ‘Wadiya’. The conflict begins as the United Nations call out Aladeen to address him on his nuclear build up. Shortly after his arrival at the United States, Aladeen is kidnapped (nobody recognises him because most of his facial hair was cut off – yes, please do scratch your head, I did too) and replaced with a ‘look-alike’, or in even better detail, Sacha Baron Cohen (Wow, 2 Cohen’s, so 2 times the jokes right?). ‘Coincidently’ a feminist green grocer happens to ‘save the day’ for Aladeen as she seems to have answers to pretty much everything he needs, as well as having scary patches of hair on her armpits. This leads the narrative into the main push of the plot. 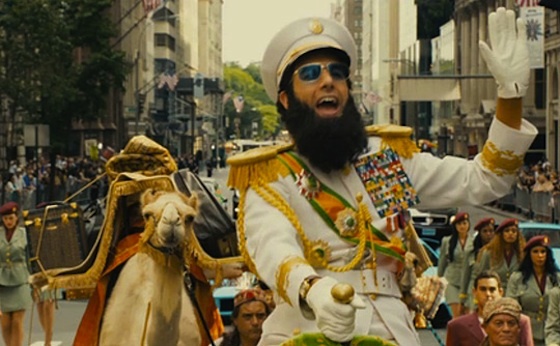 Aladeen’s begins his adventure to get back to his just spot as Leader of Wadiya so he can make his speech. The film basically mocks politics and the world leaders in a kind of tone that suggests ‘The world is run by a bunch of lost lemons’ – A message which ironically can be seen as believable at the worst of times. There are tonnes of laughs in the film. However, jokes on sexuality, racism, war and many other sensitive areas did seem to lead to awkward and guilty laughs. If you’re a free spirit, you will probably love this film. If you are someone who is not as passive, your hunger for laughs will likely end up at a couple barriers. After missing a few minutes of the beginning of the film, I entered the cinema to a house full of laughs, this was an encouraging start to my viewing. I had high hopes for the film, well high hopes for a laugh considering what previous reviews had said about the narrative. I think the best word to describe my viewing experience is, banter! I don’t want to go into too much detail because the random, stupidness of the film is quite an intriguing aspect of it. Personally, I’d recommend the film, partly because you can test if you have a bad taste of humour and secondly, so you can decide for yourself if you believe the Film has any real point. I have come to the conclusion that the film did not add on to me in any way or form, but, I did laugh. Although, I pose the question, is a laugh ALL you want out of a film? If so, you’ll have a great time, if not, you will quite possibly have less of a great time (but possibly a great times still) – I’m in the later category. I hope this review has been of aid to you. Please comment with any thoughts you may have of my review or the film itself. no new film reviews either ! lol, you’re so true, I should write a blog explaining the lack of releases shouldn’t I.